This life-long TV junkie has an opinion of the shows we’re subjected to. Yup, that’s what they’re calling it. The CW’s cash cow that is Greg Berlanti and his merry crew. Let’s face it, we’re losing a lot of Hollywood’s best creative producers: Glenn Larson, Gene Roddenberry, Jim Hensen. That’s just to name those off the top of my head. Strazynski, Lucas, and Spielberg aren’t getting younger. We’ve lost so many more and there are few rising to take the mantel and few with equal talent. I’m not going to drop the names but we know who is rising up and frankly, we are disappointed in what they’ve given us. Enter Greg Berlanti and the Berlanti-Verse. So, The Tomorrow People didn’t do as well as hoped, we can forgive Greg for this because of his current run of successful shows. This season we’re spoiled with the likes of a nightly Berlanti show (well almost nightly- should be nightly) Supergirl (Mon), Flash (Tues), Arrow (Wed), and Legends of Tomorrow (Thurs). And that’s just on The CW. This is where I’m going with this post. What’s next? Now that Clark / Superman has been cast- is there any chance we’ll see a new Superman show? How about a hero for Coast or was that Coastal City? We’ve seen in both Flash and Arrow mentions of this place. ‘The best pizza in the world” I believe Barry had said in one episode of Flash. So, who watches over this city? And did Black Lightning get the green light? I took a look at the page for the new listing Freedom Fighters: The Ray. This looks promising. 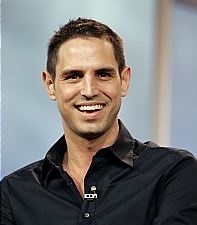 As far as I’m concerned Greg Berlanti is one Gen-Xer who’s not only risen but keeps rising. He’s proven and keeps proving his worth of the mantel left by previous visionaries of screen and television. I believe he’s found a niche in serving us heroes and superheroes. As far as I’m concerned, I’m just a fan with a healthy appetite for good TV shows, Berlanti is the man now. Keep serving up the shows Mr. Berlanti, your fans are waiting. Pondering- would CBS ever let him try his hand on NCIS or Criminal Minds? Yes, they’re a different genre but the man’s a genius and clearly knows what he’s doing. I’ve just finished watching this show- Season 1 / 13 episodes. It’s nice to see creators: Joseph Mallozzi and Paul Mullie continuing their work in science fiction. I have wondered what would be next for these two after Stargate SG1, Atlantis, and Universe. It’s nice to see that they did not disappoint. I hope there will be a season 2 and many more. Check out the IMDB Page here.